I received this yarn from Red Heart. There are affiliate links in this post. 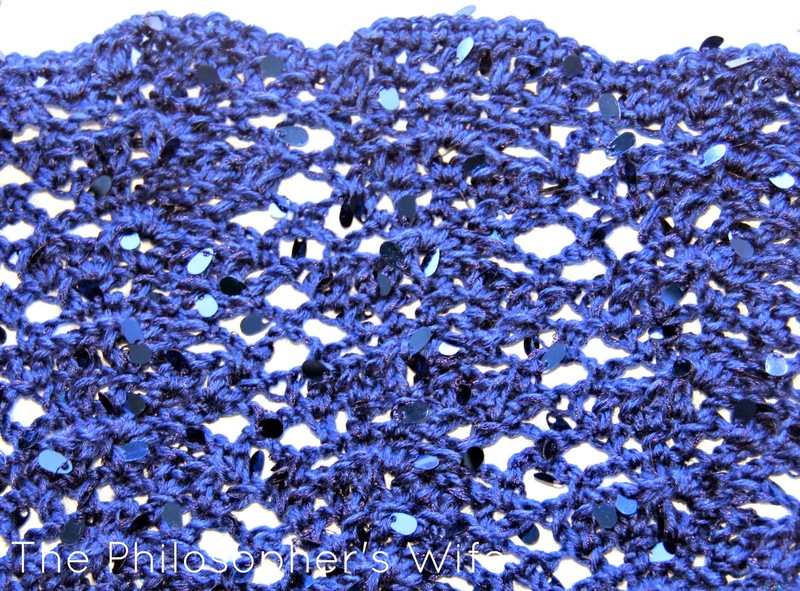 When I received this Swanky Yarn in Midnight Blue from Red Heart I knew right away that I wanted to make it into a fun infinity scarf. It took me a long time to decide what pattern would best show off this yarn's unique bling. 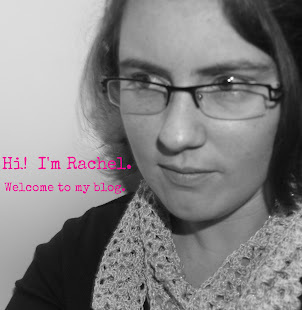 After many searches on Ravelry I decided upon the Infinity Loop Lace Shell Circle Scarf by Accessorise. The yarn is a basic yarn, but it has one cool feature that really makes it pop! It has matching oval sequins throughout. The yarn and sequins are dyed to match, so it is a unified color. The 62% Acrylic 38% Polyester yarn is soft to the touch. I was a little worried that the sequins would constantly be catching on the stitches, or just getting in the way, but they didn't. Every so often one would end up in an awkward part of a stitch, but it was always easy to adjust. I used an I crochet hook, which is larger than the H hook recommended for the yarn, but after experimenting with the pattern and yarn that's what I thought showed off both the yarn and the pattern best. The pattern is well written and easy to follow. There are a lot of pictures included in the pattern. There are two lengths for this pattern. I made the longer version. At first I crocheted the chain for the shorter version, but it seemed really small. The larger version is perfect. I didn't crochet as many rows as the patter called for, as I was only going to use one skein, but I think it ended up perfect. I did add one row of single crochet at the very bottom. I think that it helped define the scallop edge a bit. When I first saw this yarn I thought it would be perfect for my sister. She both loves blue, and I this shade would look great on her, so this scarf was a (slightly belated) Christmas gift for her. Be sure to check out this week's Yarn Fanatic Party -- link up your own yarn-y projects and enter the giveaway! It's beautiful! Thanks for the recommendation; I have some of this in my stash but have been afraid to use it because of the sequins. It's beautiful! I love how the light reacts with it. It is so beautiful! Your sister will love it. Very cool yarn! I think it will be a well received gift for sure! 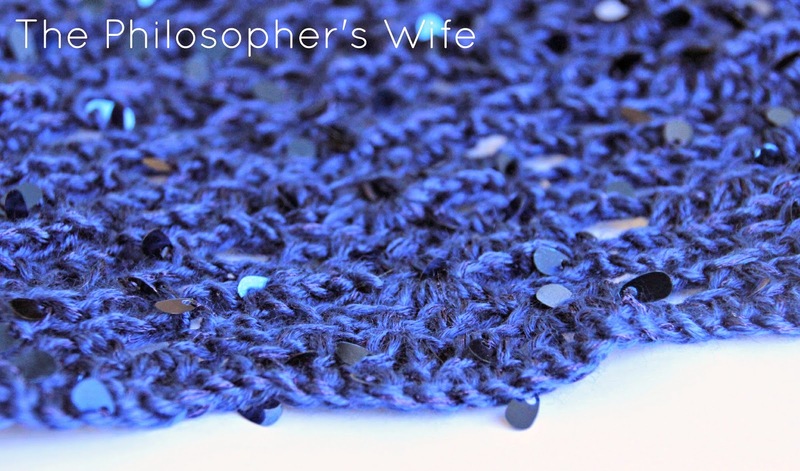 This scarf is beautiful and I really love the color of the yarn and the little sparkles in it! Have fun wearing it! Wonderful scarf! The yarn is absolutely amazing! I love it! 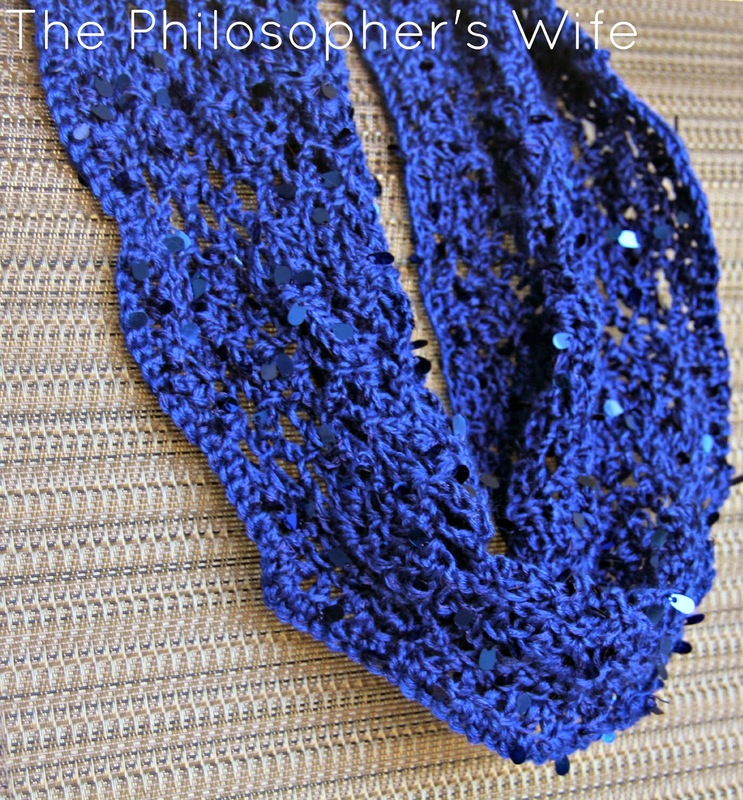 The scarf is very pretty, and I love the color and the texture of that yarn! LOOOOOVE this Scarf!!! Grogeous! & the Sparkles are Super! Really dressy & fun! What a beautiful piece of art. It look's so pretty. Will definitely try this. I have seen some Polyester Staple Fiber at FiberPartner after I receive that, I will be trying this.. Thanks for the tips. Keep exploring!.